No one to date is able to resist the most enthralling as well as thrilling fashion icon in the name of 'Planet Terror Cherry Darling Icon Moto Outfit' which is a complete treat for the passionate bikers as this terrific genuine leather attire comes with most brilliant sophisticated features like stunning three skull logo fabricated on both the sleeves that gives Planet Terror Cherry Darling attire a stunning outlook. Besides, there is a branded YKK on the front with an elegant simple round neck collar that makes Cherry Darling Icon Moto attire completely elegant as well as perfect for all choices. To add much spice to its outlook, there are beautiful icons and logos engraved with 'Red' on its entire upper making it look irresistible for you. There are too many features that gave me an option with reasons to get this jacket. I’ve really liked the zipper pockets at front shoulders. This is something I’ve seen for first time. All the related tags and cuffs skulls are adorable. "I ordered this beauty for my friend who loves classic style of clothing, I was so worried at first that whether or not he would like it but I am glad "
"I have many BTTF jacket but believe me this is one of the best Its red and black combination looks cool So, thanks for free shipping and gift." 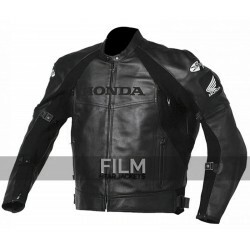 "I ordered this Honda Joe Rocket jacket so that I may have something exciting this year for winters, when I opened up my parcel I was astonished, as I "